Hi there! My name's Lynx. My mummy is a purebred Devon Rex. She's a Blue Mink. Our dad was a moggy. I have a distinct black stripe down my back. I love to play but I'm a bit of a strategist. I like to hang back before pouncing, either hiding behind the blinds or my humans before I jump. I'm also quite a snuggler and enjoy being patted and cuddled by my humans. My best bud is Lakil and we'd make a great pair, but will be fine to be adopted separately too. ABOUT DEVON REXES We're very people centred and don't like spending much time on our own. We're mischievous and good climbers. Our silky, wavy coats are quite fragile and can break so sometimes we get bare patches. And we seek warmth as our coats aren't as dense as other cats' coats - so be prepared for lots of cuddling. SPECIAL DEAL&#160; -&#160;TWO KITTENS FOR THE PRICE OF ONE So it's a great time to adopt! &#160; I CAN FLY TO PERTH! Flying for a few hours is very important for animals in remote locations because it gives us the opportunity to be adopted. 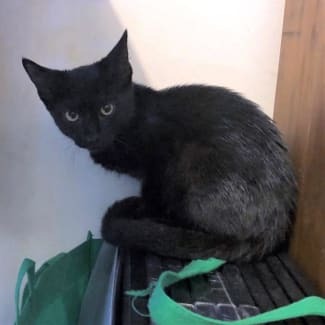 Talk to SAFE about flying me to Perth for around $50 airfare for just me - or with another kitten too for the same airfare because we can fly in the same crate! &#160; 6 GREAT REASONS TO ADOPT FROM SAFE: &#10004;Lifetime guarantee: if you can no longer care for me, SAFE will take me back &#10004;Discounted airfares &#10004;Adoption fee includes vet check, first vaccination, microchip and a voucher for desexing &#10004;Foster care instead of cage confinement, so I get lots of love and socialisation &#10004;Speak directly with my foster carer &#10004;Quick response to your enquiry &#160; APPLY TO ADOPT ME Want to spend lots of time with me to play and have fun? Click on the link and complete an application. If you fill it in with as much information as you can, it will speed up the adoption process. Then I could be with you in no time! Cheers everyone! I'm Lionel. My mummy is a purebred Devon Rex. She's a Blue Mink. Our dad was a moggy. I have a bit of the Devon Rex type fur. It's a little longer and wilder than what you'd see on a typical tabby. I'm a jumper!!!! I can jump very, very high and am by far the highest jumper of all 5 kittens! ABOUT DEVON REXES We're very people centred and don't like spending much time on our own. We're mischievous and good climbers. Our silky, wavy coats are quite fragile and can break so sometimes we get bare patches. And we seek warmth as our coats aren't as dense as other cats' coats - so be prepared for lots of cuddling. SPECIAL DEAL&#160; -&#160;TWO KITTENS FOR THE PRICE OF ONE So it's a great time to adopt! &#160; I CAN FLY TO PERTH! Flying for a few hours is very important for animals in remote locations because it gives us the opportunity to be adopted. 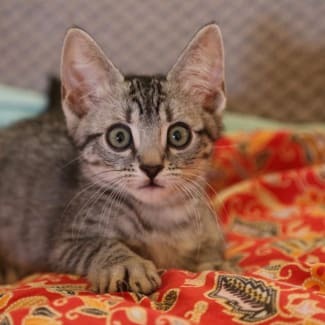 Talk to SAFE about flying me to Perth for around $50 airfare for just me - or with another kitten too for the same airfare because we can fly in the same crate! &#160; 6 GREAT REASONS TO ADOPT FROM SAFE: &#10004;Lifetime guarantee: if you can no longer care for me, SAFE will take me back &#10004;Discounted airfares &#10004;Adoption fee includes vet check, first vaccination, microchip and a voucher for desexing &#10004;Foster care instead of cage confinement, so I get lots of love and socialisation &#10004;Speak directly with my foster carer &#10004;Quick response to your enquiry &#160; APPLY TO ADOPT ME Want to spend lots of time with me to play and have fun? Click on the link and complete an application. If you fill it in with as much information as you can, it will speed up the adoption process. Then I could be with you in no time! Hi! I'm Lidar. My mummy is a purebred Devon Rex. She's a Blue Mink. Our dad was a moggy. I have very smooth fur and am the only one with blue eyes. I'm a lovely little kitten! I have a bundle of energy but am slightly less coordinated than the other kittens, probably because I'm the smallest. I was a mummy's boy! I have very distinct spots on my fur and my belly is especially spotty! Both my body length and build are much smaller than the other kittens. ABOUT DEVON REXES We're very people centred and don't like spending much time on our own. We're mischievous and good climbers. Our silky, wavy coats are quite fragile and can break so sometimes we get bare patches. And we seek warmth as our coats aren't as dense as other cats' coats - so be prepared for lots of cuddling. SPECIAL DEAL&#160; -&#160;TWO KITTENS FOR THE PRICE OF ONE So it's a great time to adopt! &#160; I CAN FLY TO PERTH! Flying for a few hours is very important for animals in remote locations because it gives us the opportunity to be adopted. 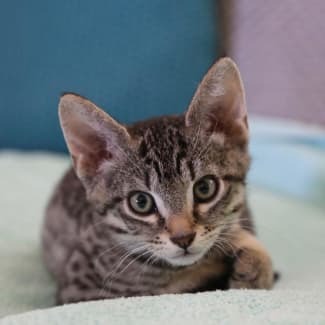 Talk to SAFE about flying me to Perth for around $50 airfare for just me - or with another kitten too for the same airfare because we can fly in the same crate! &#160; 6 GREAT REASONS TO ADOPT FROM SAFE: &#10004;Lifetime guarantee: if you can no longer care for me, SAFE will take me back &#10004;Discounted airfares &#10004;Adoption fee includes vet check, first vaccination, microchip and a voucher for desexing &#10004;Foster care instead of cage confinement, so I get lots of love and socialisation &#10004;Speak directly with my foster carer &#10004;Quick response to your enquiry &#160; APPLY TO ADOPT ME Want to spend lots of time with me to play and have fun? Click on the link and complete an application. If you fill it in with as much information as you can, it will speed up the adoption process. Then I could be with you in no time! Hi! I'm Trevor. I'm a beautiful kitten, very sweet and quiet. My coat still has tabby stripes through it but they'll probably fade as I get older. And at the moment, my eyes are different colours - but it's a bit early to tell if they'll stay that way. I'm a little shy as I had a super rough start. I was found after I'd somehow got into someone's yard, in the mouth of their dog! I was only 5 weeks old then and I've done so well in foster care with some other kittens and their mum. I'd suit a calm home best. SPECIAL DEAL&#160; -&#160;TWO KITTENS FOR THE PRICE OF ONE So it's a great time to adopt! &#160; I CAN FLY TO PERTH! Flying for a few hours is very important for animals in remote locations because it gives us the opportunity to be adopted. 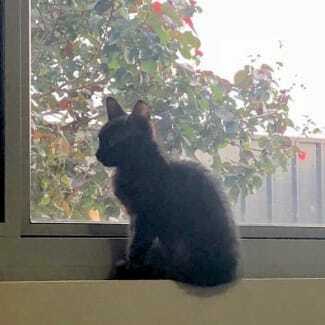 Talk to SAFE about flying me to Perth for around $50 airfare for just me - or with another kitten too for the same airfare because we can fly in the same crate! &#160; 6 GREAT REASONS TO ADOPT FROM SAFE: &#10004;Lifetime guarantee: if you can no longer care for me, SAFE will take me back &#10004;Discounted airfares &#10004;Adoption fee includes vet check, first vaccination, microchip and a voucher for desexing &#10004;Foster care instead of cage confinement, so I get lots of love and socialisation &#10004;Speak directly with my foster carer &#10004;Quick response to your enquiry &#160; APPLY TO ADOPT ME Want to play and have fun with me? Click on the link and complete an application. If you fill it in with as much information as you can, it will speed up the adoption process. Then I could be with you in no time! Hey there! I'm Quebec. My carer says I'm a very sweet boy. I love people and coming up to them for company. And I'll purr, purr, purr, when I'm nearby my carer. I'm curious about everything she does. I have lots of fun playing with my toys. And hey, I'm toilet trained too. I was very shy at first, but I loved my foster home after just one day. I'd like to find a calm home, like it is here. I'm still not that big on being picked up and will run and hide from foster mum's cat. My coat is sleek and black, with a white patch on my chest. SPECIAL DEAL&#160; -&#160;TWO KITTENS FOR THE PRICE OF ONE So it's a great time to adopt! &#160; I CAN FLY TO PERTH! Flying for a few hours is very important for animals in remote locations because it gives us the opportunity to be adopted. 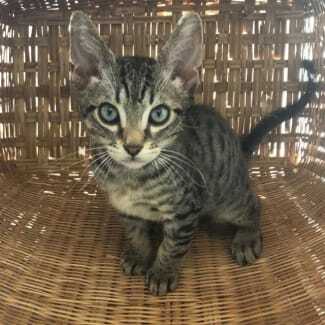 Talk to SAFE about flying me to Perth for around $50 airfare for just me - or with another kitten too for the same airfare because we can fly in the same crate! &#160; 6 GREAT REASONS TO ADOPT FROM SAFE: &#10004;Lifetime guarantee: if you can no longer care for me, SAFE will take me back &#10004;Discounted airfares &#10004;Adoption fee includes vet check, first vaccination, microchip and a voucher for desexing &#10004;Foster care instead of cage confinement, so I get lots of love and socialisation &#10004;Speak directly with my foster carer &#10004;Quick response to your enquiry &#160; APPLY TO ADOPT ME Want to play and have fun with me? Click on the link and complete an application. If you fill it in with as much information as you can, it will speed up the adoption process. Then I could be with you in no time!